With its absence of mass tourism and enviable position on the Lycian Coast, Turkey’s authentic town of Kalkan is a truly magical place to visit. This historic town is well-known for its unique architecture, quality restaurants and friendly Turkish hospitality. 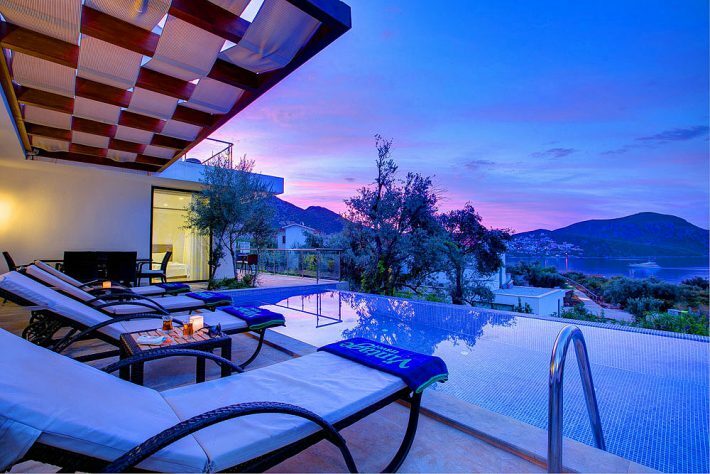 If you’ve succumbed to the many charms of Kalkan and are looking for a place to stay in this remarkable part of Turkey’s desirable Lycian Coast, take a look at Villa Royale. This three-bedroom, three-bathroom villa sleeps six guests in comfort. The property is decorated in a contemporary style and exudes style and sophistication. With cool marble floors facing vaulted ceilings, interwoven with many stylish furnishings, Villa Royale is the epitome of elegance. The villa boasts all the mod-cons you’ll need for a real home-from-home stay in Kalkan, including air-conditioning, Wi-Fi, a well-equipped kitchen and even a table tennis, for guests that are feeling competitive! Externally, the villa radiates the same chic persona as the interior. An infinity edge swimming pool looks out towards the stunning mountain and sea views. A part-shaded terrace provides guests with the option to either soak up the sun’s rays or enjoy relaxing in the shade. This stylish villa is just 600 metres from the ultra-desirable Kalkan Old Town, with its atmospheric harbour, quality restaurants and quaint historic streets that wind their way up from the harbour. The houses and buildings that line these narrow streets possess a traditional ‘Kalkan style’, characteristically built out of stone, with timber balconies and whitewashed walls crawling with bright pink bougainvillea. For guests striving for some water sports action, closer still at just 300 metres from the property are two beach clubs, with fabulous water sport facilities. To view photos, find out more and check availability to stay at the fabulous Villa Royale, visit the property’s webpage here.